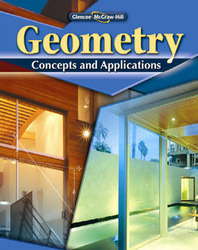 An ideal program for struggling students, Geometry: Concepts and Applications covers all geometry concepts using an informal approach. Help students obtain better understanding of geometry with the many detailed examples and clear and concise explanations found throughout each lesson. Help students prepare for tests with Glencoe's exclusive Foldables study organizers. Build student's confidence in completing assignments with Personal Tutor, Concepts in Motion, and Homework Help with Extra Practice. Familiarize your students with the types of questions and formats they will face on local, state, and national tests with Preparing for Standardized Test Practice. Increase students access for additional geometry help with Glencoe's extensive online resources including Self-Check Quizzes, Extra Examples, and Vocabulary Review aligned to their Glencoe Geometry: Concepts and Applications text. Help students prepare for tests with Glencoe’s exclusive Foldables™ study organizers. Build students’ confidence in completing assignments with Personal Tutor, Concepts in Motion, and Homework Help with Extra Practice. Increase students’ access for additional geometry help with Glencoe’s extensive online resources including Self-Check Quizzes, Extra Examples, and Vocabulary Review aligned to their Glencoe Geometry: Concepts and Applications text.